Hummingbird clearwing Hemaris thysbe, also known as Hummingbird moth, is out in the gardens and fields sipping nectar during the day and often at dusk. 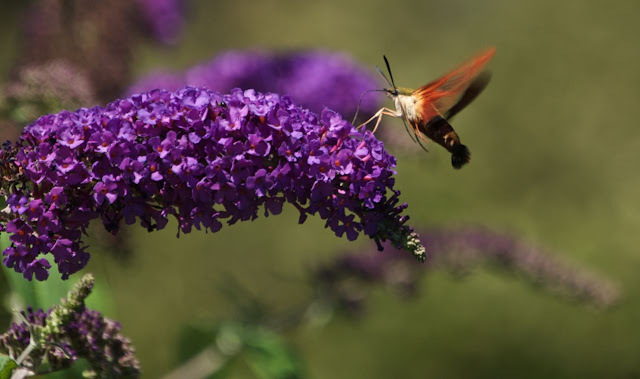 People sometimes confuse Hummingbird clearwings with a real hummingbird due to its habit of hovering while feeding with its long proboscis. Host plants include honeysuckle, hawthorns, plums, cherries and snowberries. Note the difference in the two species above and below. Snowberry clearwing Hemaris diffinis is more black but its coloration can vary. 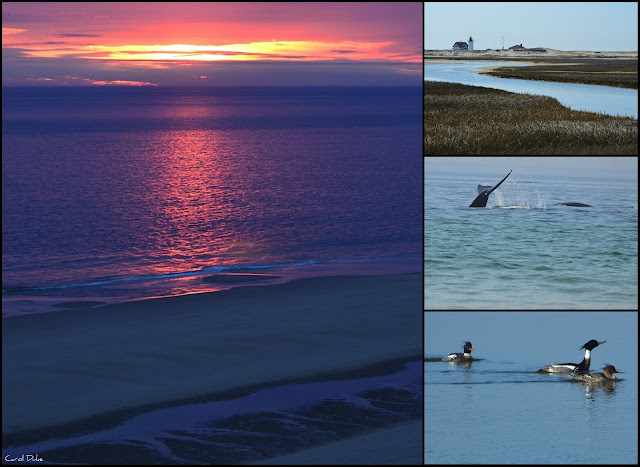 As its name implies . 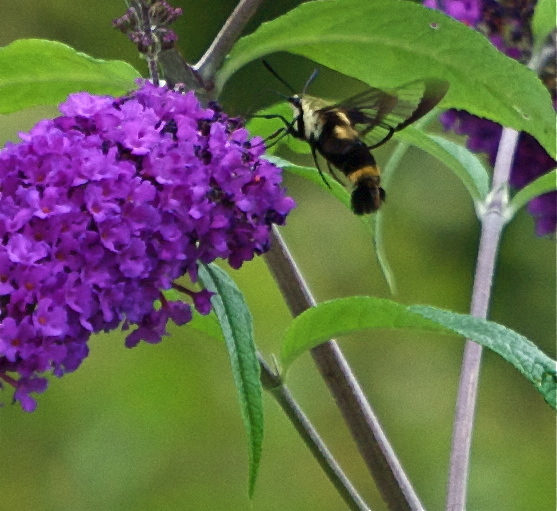 . . this clearwing relies on snowberry. Other host plants are honeysuckle and dogbane. 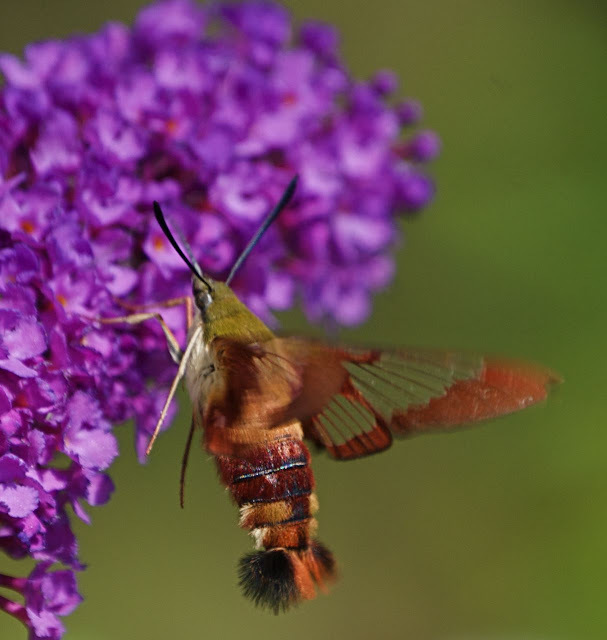 Snowberry clearwings also fly about in the daytime and are more often seen in the summer months. 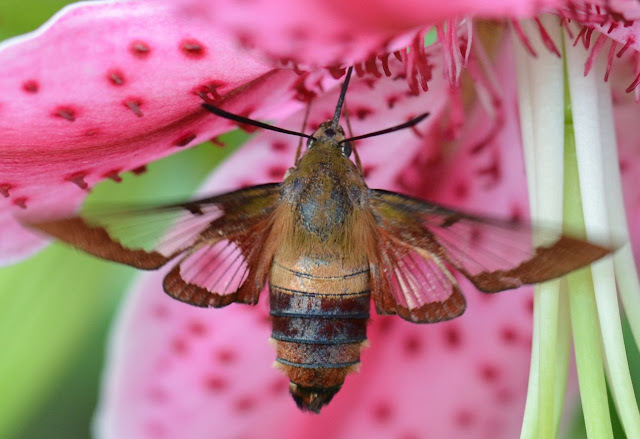 All of the clearwings or Hummingbird moths are spritely flyers and like many butterflies they depend on our not being too fastidious with our clearing of debris, for they need leaves to spin within their cocoons and detritus along the ground offers protective covering through the cold winter months, while the pupa wait for spring. The lovely pale green Luna moth Actias luna, is one of the largest moth species in North America and is only active in the dark hours of night. Females can lay up to two hundred eggs. Here at Flower Hill Farm our Shagbark Hickory, White birch, Walnuts and even Sumac act as host plants. The caterpillars munch on leaves and shed their skin five times, as their relative butterflies and then overwinter in their silky cocoons beneath the chosen host plant. The adults have no mouth parts . 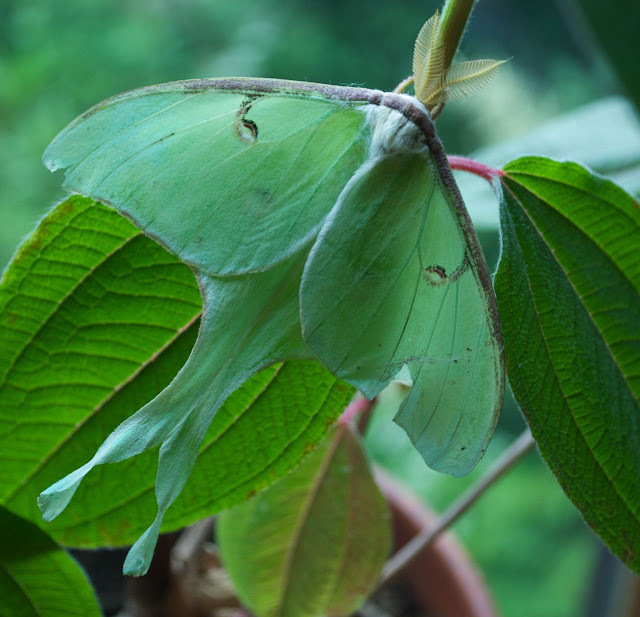 . . imagine a simple life of sleep, flying and mating for one week only and you have an idea of the life of an adult Luna moth. I forget to turn off a light the night this Luna moth comes to visit. Early next morning I carefully carry the sleeping moth inside, so that the birds will not have an unfair advantage. He sleeps all day and when the curtain of night falls, I hold him out to the dark air and watch as the beautiful creature takes his ghostly flight into a night of pursuing pleasure. 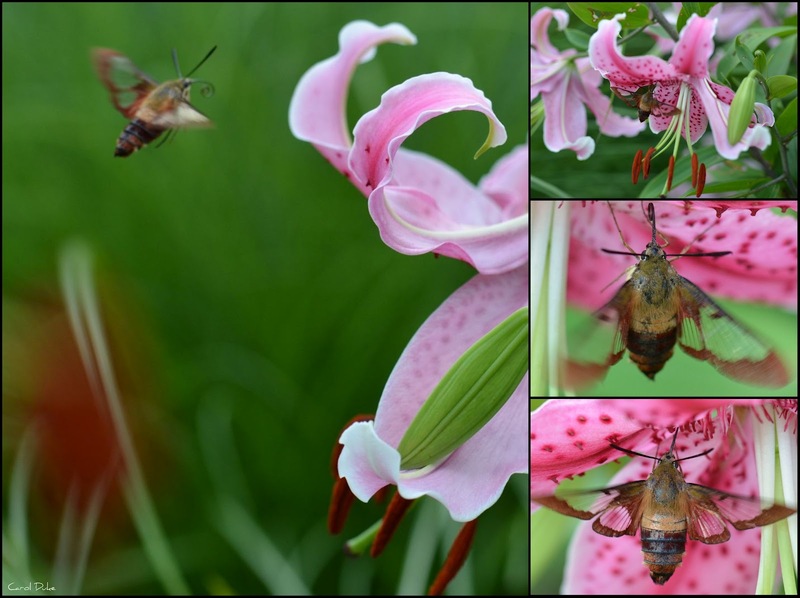 They have amazingly strong wings but sometimes fall prey to our beloved bats. A member of the Saturniidae family, Luna moths only have one brood here in the northeast. I usually see them in May but the one above was found in June. It looks like it might be already a few days old. 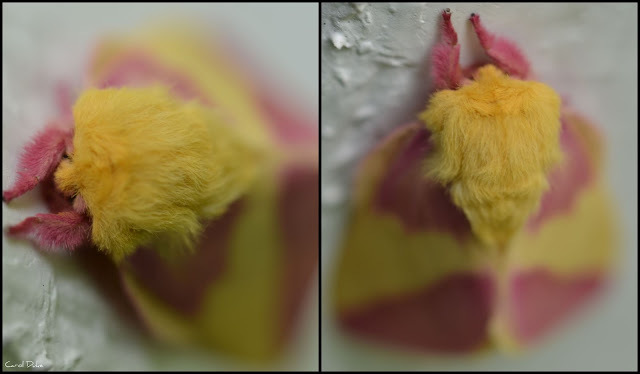 Another member of the Saturniidae family, the Rosy maple moth Dryocampa rubicunda also has no need of a mouth for they too do not eat as adults. Much smaller than their Luna cousins, the Rosy maple moths will also be attracted to a light and then will sleep through the night and next day. If a light is accidentally left on, I try to get them to fly into nearby plants in order to hide from birds. 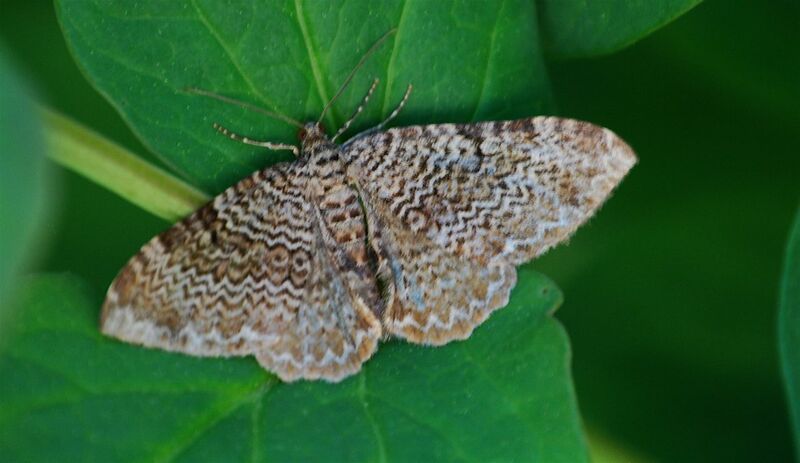 Females lay eggs on leaves of oak, sugar maple and other maples. The caterpillars spin a cocoon and sleep through the winter months. 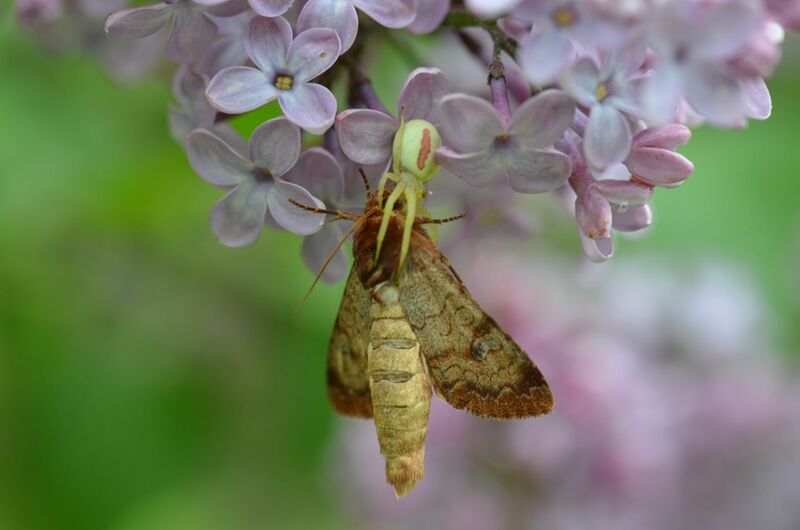 A mystery moth in the clutch of a flower crab spider. 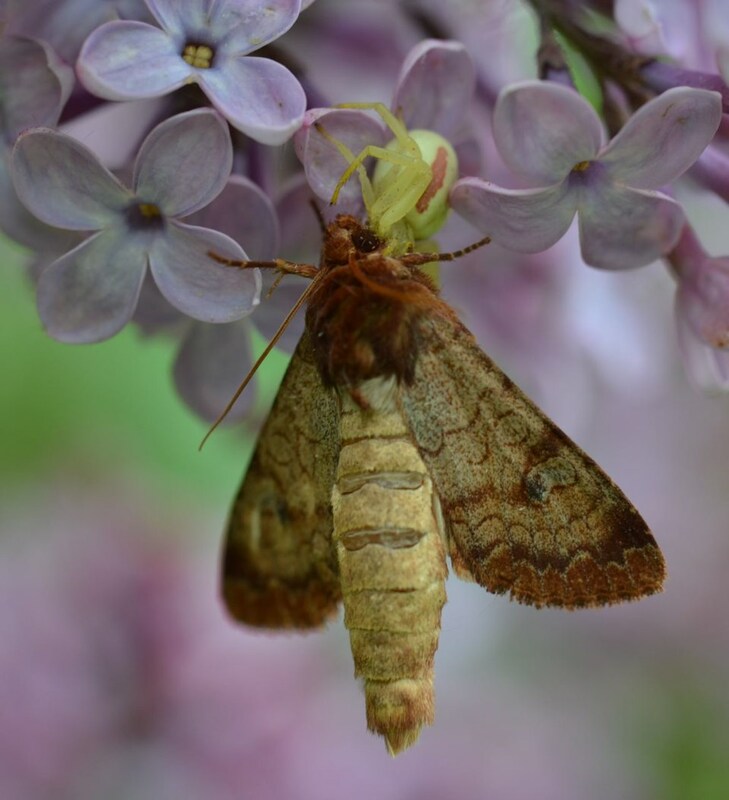 Moths can be very beautiful and their caterpillars can be very striking too. White Spotted Sable Moth Anania funebris, can be found in our fields and gardens in the daylight. The host plant is Goldenrod. Intricately patterned mystery moth found on tree peony leaf. 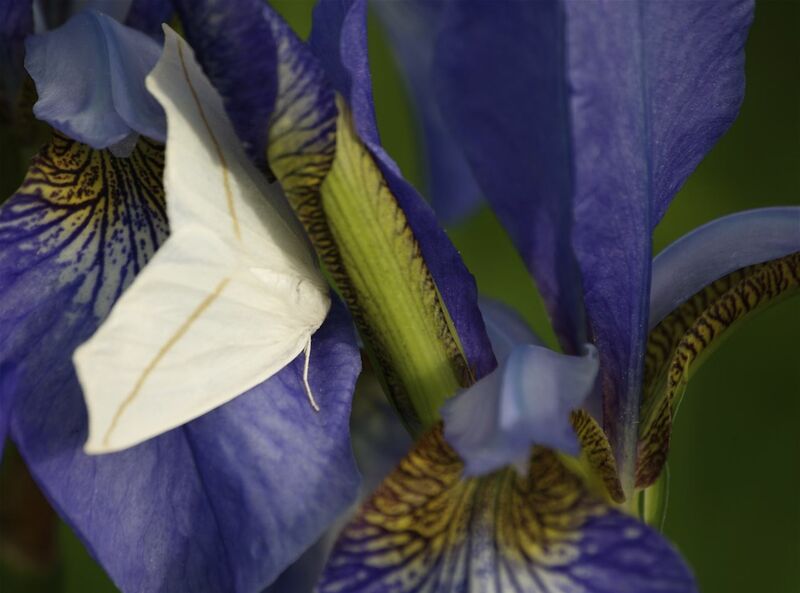 Lovely white mystery moth with a yellow line through both wings found on iris. I missed Katarina’s Floral Friday because I was enjoying a break with a dear friend by the sea . . . and studying color with a fabulous expressionist painter and teacher through Provincetown Art Association and Museum. 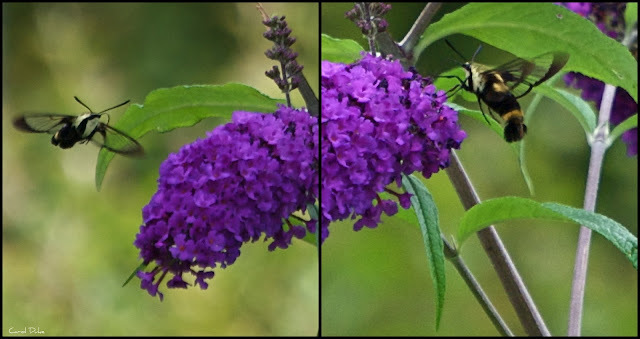 Though there is not a wildflower within any of these photos the moths are pretty wild and hopefully considered wild enough for Gail’s Wildflower shadings. The light and colors in Wellfleet, North Truro and Provincetown were magical! I came home to spring but tonight is dipping down into the teens. Ouch! My teacher has encouraged me to use black paint in my work. Black can surely evoke power. 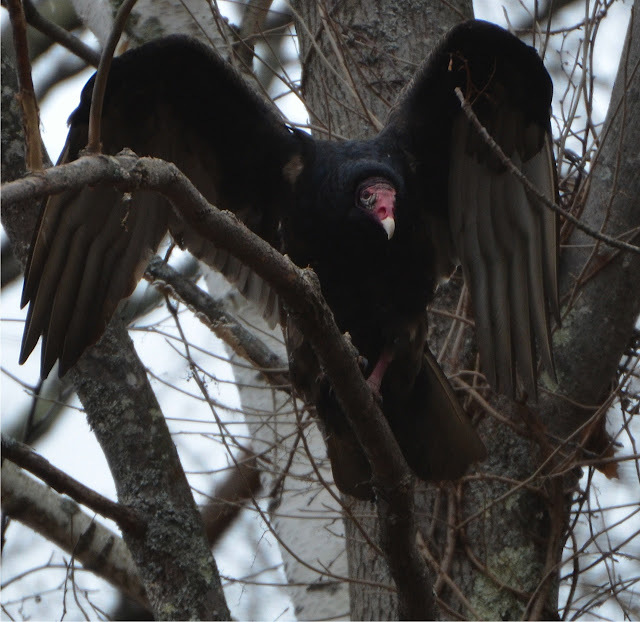 Turkey vultures are certainly more ‘photogenic’ than I had imagined. Attractive might be a stretch but truly . . . what a magnificent creature.